Who would have thought that I would enjoy making these tiny cards so much?! I love it! Today's card is inspired by this week's challenge at Off the Wall Craftiness. 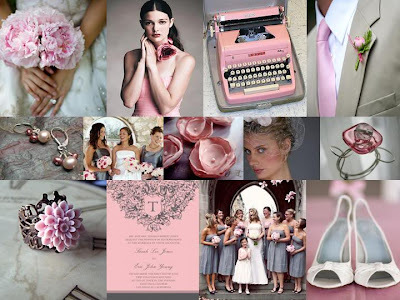 I love the challenge mood boards here and have been meaning to join in. So, I'm finally doing it! I giggled a bit when I read Kim's story about her Ken doll. My mom and step-dad's wedding was gray and pink, and it sounds like her Ken doll was dressed just like my dad was! I love these colors together! Check out the picture right smack in the middle there. That's my inspiration! I cut various circles with my beloved punches and stacked them together. It didn't look quite right, so I rolled each circle, forwards, sideways, and backwards and peeled the card stock layers apart. I love this technique because it makes the flowers look much more delicate! Then I adhered the layers and crumpled up the edges a bit more. I added Pearl Jewels to the centers (can you tell that I love the new Jewels from Stampin' Up!?) and layered them over a Basic Gray Taffeta ribbon on my Basic Gray card. Love it! I love pink and gray and you so nailed this one. I love those circle flowers. How chic and elegant!